The festive note, which was penned to music producer Tony Cox in 1968, is being advertised for a five figure amount. 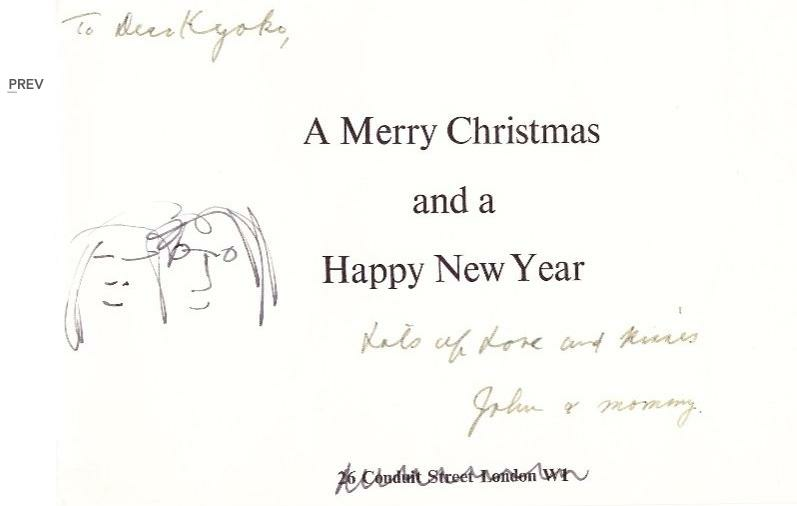 A Christmas card written by John Lennon is on sale for $15,000. wife Yoko Ono's ex, music producer Tony Cox, and the former couple's daughter, Kyoko Cox. The card, which is being sold on MomentsInTime.com, is believed to be referring to Yoko - who was married to Tony from 1962 to 1969 - moving out. "We'll put it back or send it depending where you are. Hope it's o.k. there - it sounds it. Another page of the note sees John asking Tony where the mastertapes of a 1968 concert Yoko performed are, and two of her short films. He writes: "We can't find them." Back in February 2016, a four-inch lock of John's hair sold for $35,000 at auction. The Imagine singer's tresses were chopped off prior to his 1967 movie role in How I Won the War. What's more, his Rolls Royce Phantom V once sold for $2.23 million and lyrics to Beatles hit 'All You Need is Love' fetched $1.25 million.